Arriving once more at Guang'AnMen BeiBinheLu : We turn into the hutong via this unnamed street, which is not even mentioned on detailed maps of Beijing. 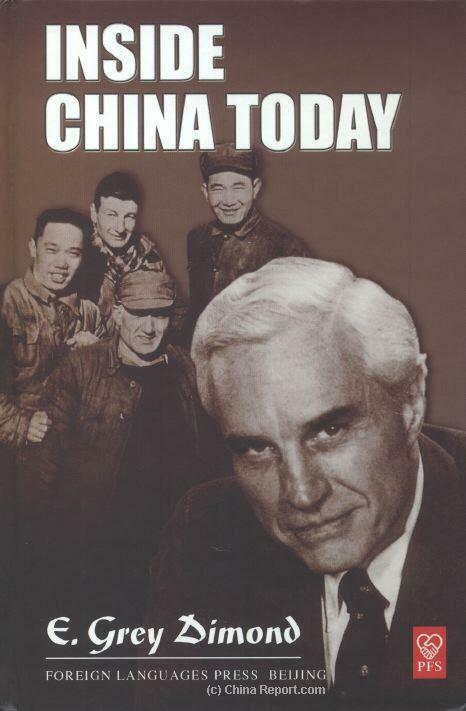 Never mind that ! You can't miss the Tower by now. 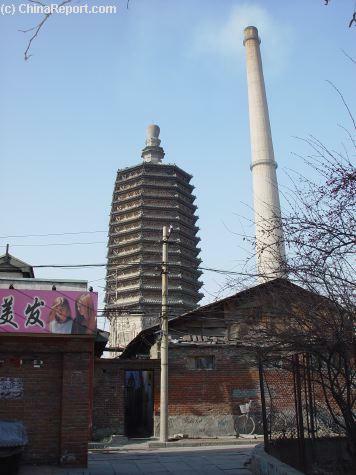 If you really would like to be sure - go further down South to connect with TianNing Si qian jie', which is the offcial route to the Temple. 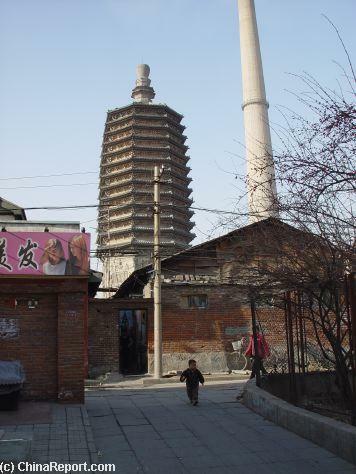 We personally prefer this shorter route leading directly into the Hutong and the preferred athmosphere. massive crowning pearl, came thundering down. 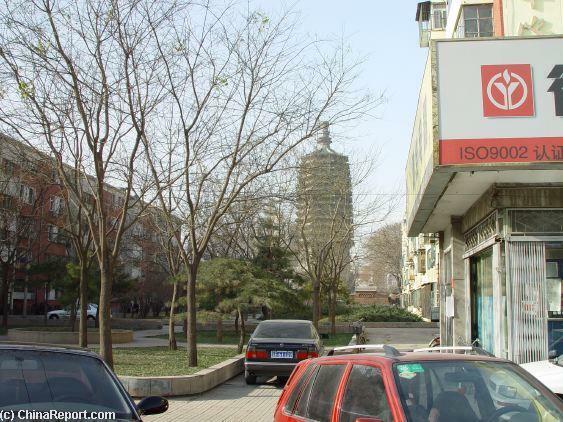 The area of Beijing most severely hit lay around Qianhai and Houhai Lakes, with a large area of hutong destroyed and/or damaged. 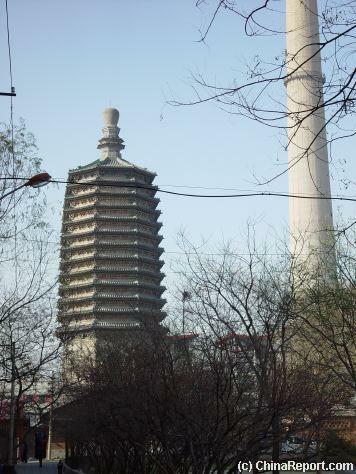 As described in this website and in the book "Inside China Today", Behai Park's magnificent Bai Ta (White Dagoba) was severely damaged, as was the nearby home of Ma Haide (Dr. George Hatem), which is not our story. 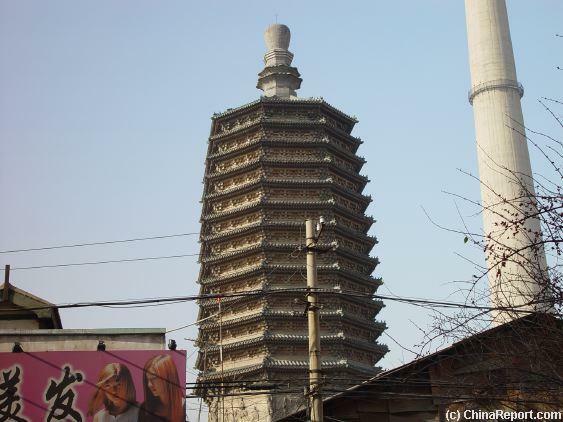 Tian Ning Temple escaped reasonably unscathed, with the Tower minus crowning Pearl intact. And so the ancient Stone Tower lived on to make even more history. Looking up to this awesome 13 story Pagoda Tower, with all its intricate details and "carpentry". Brick not Wood, or .. is it ?? 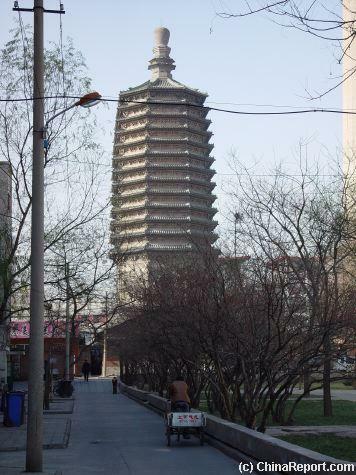 Source Book "Historic Chinese Pagoda's"
March on towards the West while enjoying this much quieter street in full view of the Pagoda Towers' Eastern flank. With every step the interesting details of the Tower with its huge symbolic Pearl atop become more visible. Approach even closer and note how the Tower very strongly resembles a wooden Pagoda from a distance. Rich details and a construction from parts identical to the earlier used wood make it impossible to distinguish materials used. 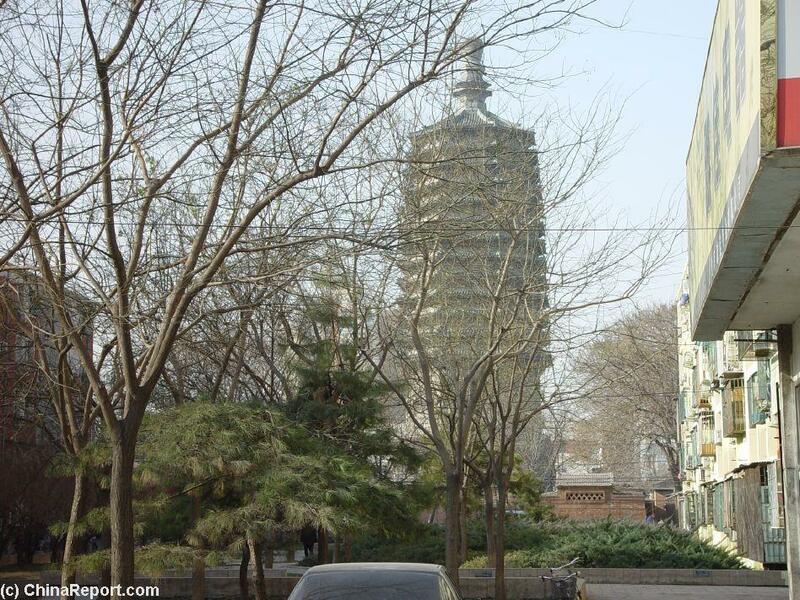 Taking a breather from the busy traffic around TianNing Overpass while enjoying pagoda and small park. Around the corner from the Temple gate. Two towers 8 centuries apart.